Mariah works out at the beach, in an effort to shed the baby weight, so unconventional but it's refreshing to see a celebrity going hard to get back in shape especially when they have the resources to get plastic surgery. Alicia Keys is another celebrity mom that has decided to work hard at getting back in shape, earlier this summer she was photoed jumping rope. So cudos to you new moms. 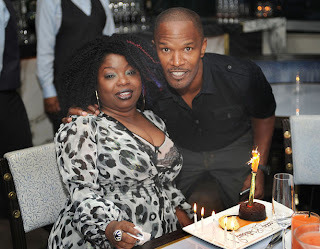 Who knew Jamie had a sister, he celebrated her birthday yesterday at Fontainebleau in Miami, she looks like a soul sister to. Happy Bday ma!